The International Forestry Review journal has published our paper on forestry capacity development in Kenya. The paper details the process of the curriculum review undertaken at the University of Eldoret in collaboration with the University of Eastern Finland. The need analysis carried out revealed which were the subject-specific and generic competencies needing more attention, allowing for the prioritization of these areas in the review. 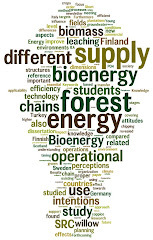 Not surprisingly, among them was the area of bioenergy. In the context of the challenges that forestry education faces, the improvement of curricula to increase its attractiveness and address the changing needs of the society is imperative. With the aim of improving the forestry education offered at the University of Eldoret in Kenya, a joint project was carried out together with the University of Eastern Finland during 2011–2012. One of the tasks of the project was to revise the curriculum of the undergraduate programme in forestry. According to the needs assessment, the biggest gaps in subject-specific competencies were in areas such as forest information systems and forests and climate change, as well as in generic competencies such as computer skills. The need to update and expand contents (e.g. on dryland forestry) and learning methods (e.g. more practicals) clearly emerged. The proposed changes in the context of various initiatives to improve forestry education in Kenya and worldwide are discussed.